I've been a DJ, news reporter, missionary, and ambulance driver. Now, I'm an Anglican/Episcopal priest and assistant chaplain at Emmanuel College, Cambridge where I'm writing a doctoral dissertation about religious change in South Sudan during civil war in the 1980s and 1990s. My most recent book is "Backpacking through the Anglican Communion: A Search for Unity." In 2017, I was invited to deliver the keynote address to the Society for the Study of Anglicanism and reflect on Anglican theology and global migration. The Journal of Anglican Studies has recently published the result. You can read the whole article online. Here’s a snippet. I have sometimes asked my students if, in looking at the Bible, it can be said that God has a preferential option for the migrant. There are many ways in which I think that is true: God has a particular concern for those without a place. But it is also true that displacement is not the end of the story. In the tension between place and displacement, guest and host, journey and destination, we may find, as Bernard Mizeki once did, a new Christian identity and a deeper faithfulness to God. As the snippet makes clear, I draw on the story of Anglican missionary and martyr Bernard Mizeki to try to frame some places I think Anglican theology can usefully pursue in thinking about how we respond to the present era of global migration. On first glance, there is nothing surprising about this list. These four catalysts remind us that being Christian is about engaging not just our mind but also our hearts, souls, and bodies as well. Each leads us deeper into engagement with God made known in Christ—in word, in sacrament, and in prayer. The list points to the importance of the kind of work we do in the college, forming people who see themselves as leaders of Christian communities. In one way or another, each of these items is a hallmark of our Anglican tradition. You might, therefore, find yourself asking: if the key catalysts for spiritual growth are hallmarks of the Anglican tradition, how come Anglican churches aren’t universally thriving? But as I look at the list more closely, I find myself asking how many of these catalysts are actually present in our churches. To take one example: it’s not clear to me that all of our churches have regular and readily-accessible Bible study groups and strongly encourage their members to participate in one. To take another: it’s not clear that all our churches create varied and regular opportunities to explore prayer in its many forms outside of the Sunday morning liturgy, or teach their parishioners how to pray. This report is one contribution to the vigorous and welcome debate about the future of the church and of Christianity in an increasingly secular west. One message I take from this research is that part of the key to church renewal lies in returning to the habits and practices that have long been foundational to our Anglican tradition. In 2010, I first went to Bishop Gwynne College, an Anglican theological college in Juba, South Sudan. Among the many students I met was Simon Wal Geng, a bright, funny, and hard-working student. Unusually for a member of the Episcopal Church of the Sudan, Simon was a Nuer and part of a small minority at the college. Nonetheless, he made many friends. I remember the way he engaged in the classroom and in conversation, whether that was when we talked about the ways in which our churches were different or when he was learning about agriculture in the college’s model garden. I remember how he liked to joke and to laugh but also was serious about his studies and knew the opportunity that had been afforded him by being able to study at Bishop Gwynne. I later learned that the college administrators had taken a chance on him in letting him enroll on the introductory foundation year. His past academic performance was not terribly stellar. Through his enthusiasm and his commitment, he succeeded and eventually transferred into the diploma program from which he in time graduated. Last July, I learned that Simon had been shot and killed in the violence of South Sudan’s ongoing civil war. He had returned to his home diocese of Akobo and was arranging local meetings for peace (something that grassroots church leaders in South Sudan have a lot of experience with) and it was then that the fatal shooting occurred. As with many deaths during this civil war, the details are sketchy but the outcome is not. Simon’s death is but one of many senseless deaths and one that makes peace that much harder to achieve. Pope Francis has designated this Friday, February 23, as a special day of prayer and fasting for the people of South Sudan and the Democratic Republic of the Congo. Many Anglican leaders have joined this call as well. When I think about the scale of violence in these countries and in the world, it is hard not to feel overwhelmed and discouraged. When I think about the senselessness of a death like Simon’s, I grieve at the potential futures that are lost because of it. Prayer and fasting, in lament, from a place of pain and grief, are a wholly appropriate response. But as a Christian I also know that it is in death that God in Christ works God’s great power to save. So I pray as well that Simon’s death and the deaths of so many tens of thousands of others become places in which the people of South Sudan and the DRC may see God’s reconciling grace working in new ways. At several moments in the past week, I have been reminded that Easter is no longer just a holy day for Christians. This week’s edition of Waitrose Weekend, the free newspaper offered by the grocery store chain, lists “100 things to do this Easter.” On the list are such activities as make a robot, time for a spring clean, visit a beer festival, and get involved in the fun of a country fair. Not on the list: anything to do with attending church, marking the resurrection, or meditating on God’s great love for the world. None of this is particularly surprising. In England, Easter falls in the midst of school holidays and a four-day weekend; families need things to do to fill the time. Ad-men are always looking for a new hook with which to flog their wares. But the series of events was a reminder of how Christianity exists in a world of multiple faiths. We often talk about Islam or Judaism but rarely do we understand consumption as a faith. Yet that is precisely what it has become. It defines ethical norms (consume more) and sets the boundaries of our thought horizons (non-consumption is simply not an option). And, as has happened many times in the past when different faiths interact, one is taking over the holy days and holy sites of the other. In the same way that the Christian feast of Christmas came to overwhelm the feast of Saturnalia in ancient Rome and in the same way that Christian missionaries once built churches on sites that had been sacred to existing religions, the religion of consumption (if we can call it that) is taking over Christian holy days. It’s easy to see how this has happened with Christmas. These recent events indicate the way in which it is true of Easter as well. When that Cadbury’s executive said that “Easter will continue to be part of our marketing strategy,” I think he meant to reassure people who had protested at the exclusion of Easter. But I didn’t find it particularly reassuring. The trouble is that the deep-seated beliefs of the religion of consumption are diametrically opposite to the good news that is proclaimed on Easter day. In the religion of consumption, you succeed by buying, acquiring, getting, claiming, and otherwise coming to possess things. One’s salvation, you could almost say, depends on what you have. 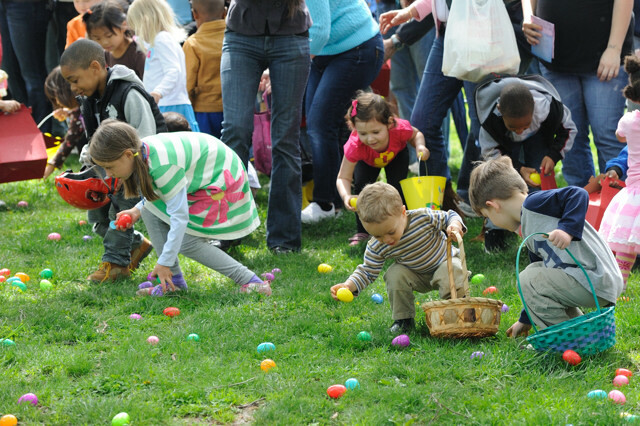 The person who wins the (Easter) egg hunt is the one with the most eggs. Christian theology has a term for this: it’s called works righteousness and it’s the belief that what we do is what makes us right before God. In the religion of consumption, what we purchase and acquire is what makes us right within the framework of that system. On Easter morning Christians proclaim that we are made right before God not because of anything that we can do but because of what Christ has done. God in Christ came into our midst—and we put him to death. Christ’s response was to rise from the dead and return to the very people who had denied him and say, “Peace be with you.” The good news of the gospel is that our efforts to make ourself right will always come to naught—but Christ’s work always will. The religion of consumption (or whatever you want to call it) is exercising a greater and greater hold over society. But the vision of the good life that it offers will always be a mirage. By our own work, we will never be able to achieve it. That’s why the good news of Easter morning is so important. It is Christ who promises and delivers life abundant. Another day, another truly outrageous decision from the Trump administration: all citizens from seven countries and all refugees are to be banned from entering the United States. It’s easy to find reasons to be outraged: theological, practical, national. The Bible repeatedly makes it clear that God takes the side of those who are on the move. It is by being migrants and from migrants that we learn new things about God. This shuts down that possibility. Trump explicitly invoked 9/11 and the importance of keeping the country “safe”—but none of the 9/11 hijackers came from countries on the banned list. Yet somehow, none of this feels sufficient. It feeds my outrage but it does frustratingly little in the real world. I can’t turn up at JFK airport and protest. I’m not a lawyer and I can’t file a suit to reverse the decision. When confronted with such a great injustice, how are we to respond? I’ve been thinking this week about my 7-year-old niece. Sometime last fall, the news about Syrian refugees combined with the rhetoric of the presidential campaign became so uncomfortable and upsetting to her that she decided she wanted to do something. So she told her parents, “Can we have a clothes drive to help refugees?” Her parents did a little research on this and decided that the refugees who had been resettled into their (red) state were well clothed. Shipping clothes to a place like Greece or Turkey was an inefficient use of resources. So my niece had another idea: “Can we make friends with some refugees?” It turned out that not far away from their house lives a refugee family from Congo. It took a little doing and some awkwardness, but pretty soon my niece and her parents started getting to know this family. They learned about some of the challenges they’re facing: the father’s working hours place a burden on the mother and children; they struggle to stay in touch with family members back home; the children need help in school. I’m not sure how much of this my niece has processed. From what she tell us, it sounds like she mostly just enjoys having some new friends. Once a week, on the way home from school, she spends time playing with them at their house. It’s a young relationship: who knows how it will develop? I think my niece is on to something. To live in our political moment is to be bathed in outrage. Fine. There are lots of things to be outraged about. But the best way to challenge the the Trump administration is challenge it in our actions. As my niece shows, those actions don’t have to be heroic or extraordinary. They can be as simply as modestly altering our weekly schedule to incorporate a new activity. Think about what it means to say, “Can we make friends with refugees?” It means that refugees have value, that they enrich our lives, and that they are welcome in her community. It takes a step further than a clothes drive: it involves her life in theirs and theirs in hers. Simply by existing, the relationship she has with this family challenges Trump’s impoverished moral calculus. There’s no executive order he can sign to ban it.